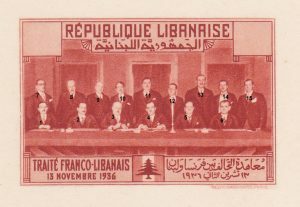 This article is an attempt to identify the political figures depicted on the famous “unissued” Franco-Lebanese treaty stamp (Maury 149 A/D). 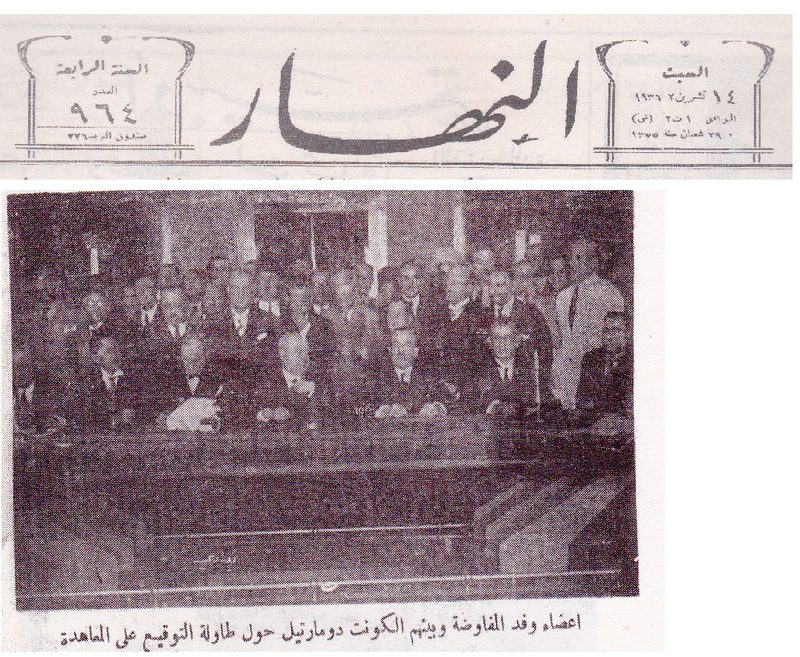 To remember that the treaty was signed on the 13th of November 1936 (figure 1). Thus it will not be our concern to explain the historical context that led mandate French authorities to accept such a treaty nor the internal Lebanese political situation during this crucial period of our modern history. 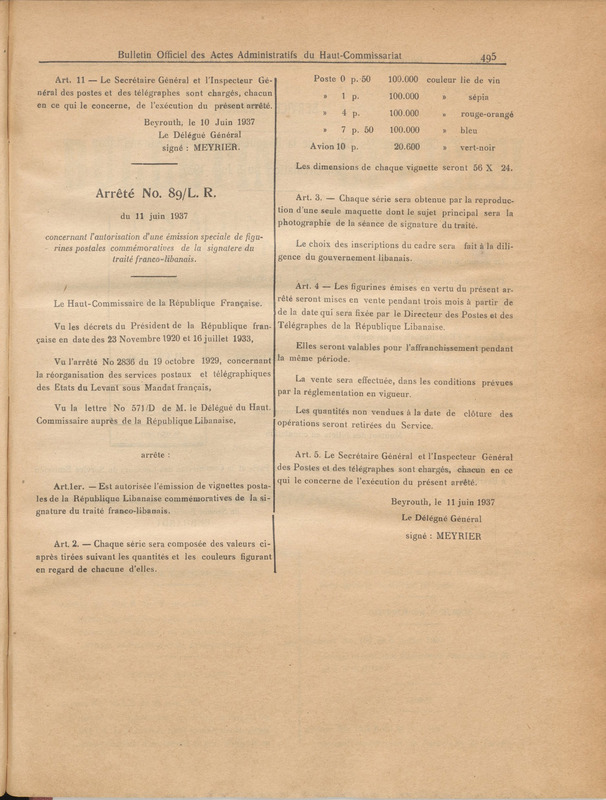 French high commissioner authorized the issue of a five value stamp set pursuant to decision number 89/LR (11 June 1937). 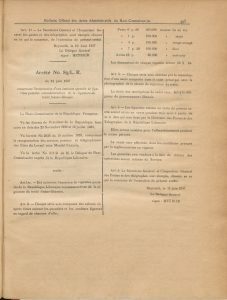 Article 3 of the decision specified that the stamps should represent a “photo illustration of the ceremony during which the treaty was signed” in the “Petit Sérail” palace. 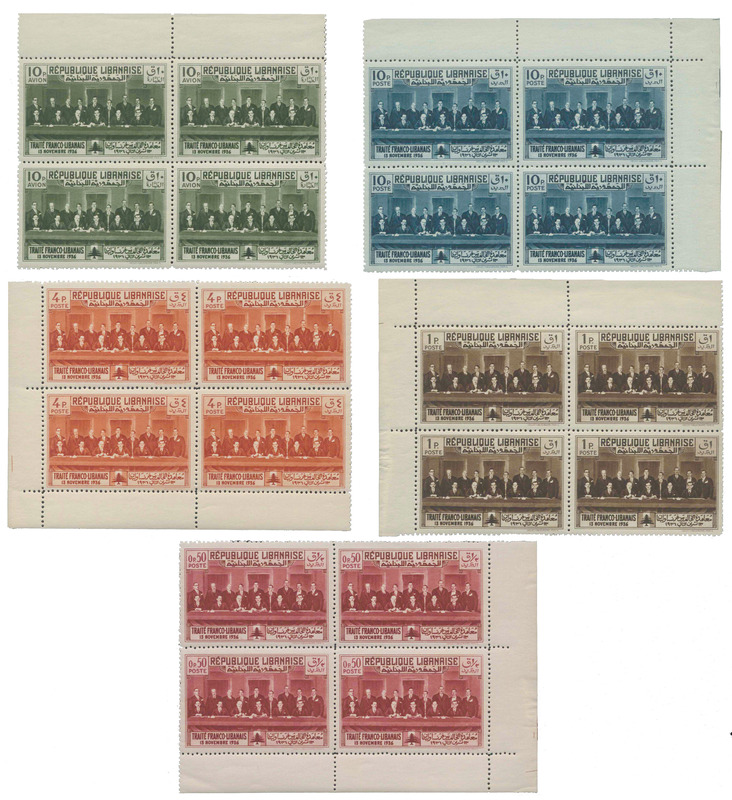 It is worth noting that the original values of the five stamps were as following: 0.5P, 1P, 4P, 7P50 and 10P (each issued in 100’000 copies except the 10P airmail with a print run of only 20’600 copies). (Figure 2). 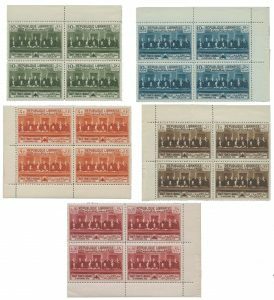 The values were modified two times to cope with new postage rates introduced respectively on 1 Agust 1937 and the first of 1 Jenuary 1938. In consequence decision 122/LR (9 august 1937) modified the initial values as follows: 0.5P, 1P, 4P, 6P and 10P. These new values were modified one last time pursuant to decision number 183/LR (9 December 1937) that indicated that the new values should be: 0.5P, 1P, 4P, 10P and 10P (airmail). 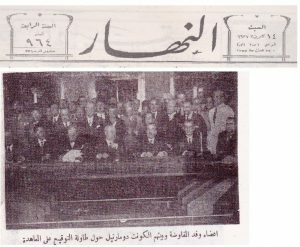 The Lebanese delegation negotiating the treaty was composed of Emile Edde (president of the republic), Khalid Shihab (president of the chamber of deputies) and Ayyub Tabet (secretary of state similar to our current office of prime minister). The French delegation was composed of Damien de Martel (high commissioner), Jacques Meyrier (secretary general) Louis Kieffer (head of the political cabinet), Pierre Laffond (the delegate of the high commissioner to the Lebanese government) and Stanislas Ostrorog (figure 4). *(deputy) not a part of the elected delegation but participated in the negotiations as well. **(from the French delegation most probably). We invite researchers to provide us with more archival material so we can confirm our findings or correct them if necessary. Bechara el khoury first appeared on a stamp in 1937 long before he became president and the 1947 evacuation of foreign troops set. 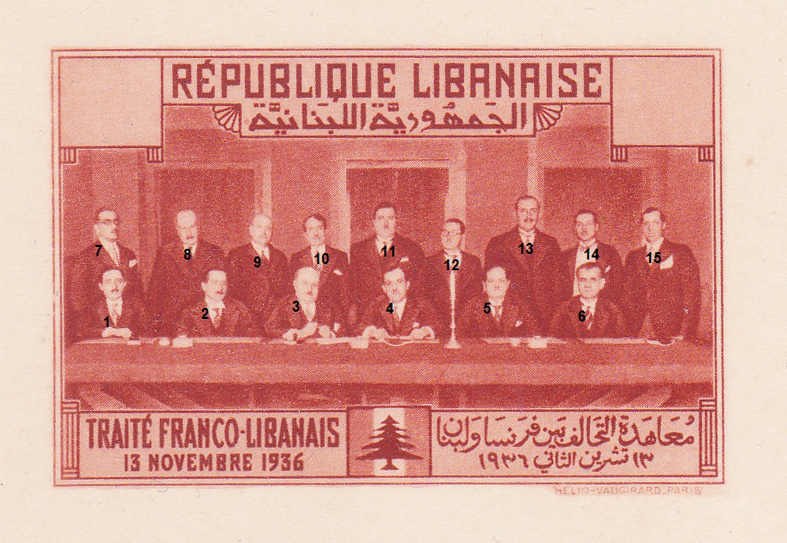 Both future presidents Ayyub Tabet and Petro Trad appeared on the Franco-Lebanese treaty stamp although they were never depicted on special commemorative issue to this day.